It has always fascinated me where people come from, our history and our ancestors. So, a couple of years ago, I started on a path to find out exactly where it all started. The information on the internet’s so detailed and with the right names and birth dates at hand, you can go back for many, many decades. Today I will share with you some very interesting information we discovered, and the woman I am writing about, is the great Aunt of Bob (those of you who know me will know exactly who he is!! :)….on his Mother’s side (June Avis Graydon). His grandfather was William Graydon and Edith Graydon (whom I’m writing about) was his sister. Edith Jessie Thompson was born Edith Graydon on the 25th of December, 1893 in Dalston, London. She was a very happy and talented girl who was academically bright and excelled at dancing and acting. She met Percy Thompson at the age of fifteen and married him in 1916, after a six year engagement. 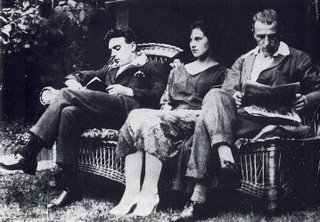 Into their fourth year of marriage, the couple met the 18 year old Freddy Bywaters and the twenty-six year old Edith was immediately attracted to the young Bywaters and soon after, they began an affair. Her husband dicovered the affair and confronted the pair. As Freddie Bywaters was a seaman who went away for long periods at a time, she frequently wrote him letters (more than 60 in total) passionately declaring her love for Bywaters and her desire to be free of Percy. She also declared in these letters how she grounded a glass light bulb to shards and fed them to Percy, mixed in his mashed potatoes, and on another had fed him poison. Not only did he not die, he totally failed to become ill and Edith then implored Freddy to “do something desperate”! On the 3rd of October, 1922 the Thompsons attended a performance at the Criterion Theatre in London’s Piccadilly Circus and on their return home, a man jumped out from behind a bush and attacked Percy. After a voilent struggle, Percy was stabbed and mortally wounded. He died before she could summon any help and the attacker fled! At the police station she was very distressed and confided that the killer was indeed Freddy Bywaters. Believing herself to be a witness, rather than an accomplice, she provided them with details of her association with Bywaters. A trial began on December 6, 1922 and found both Thompson and Bywaters guilty, sentencing them to death by hanging! The body of Edith Thompson was buried in an unmarked grave within the walls of Holloway Prison, as was customary. On 13 November 1993, a grey granite memorial was placed on plot 117 and dedicated to the memory of the woman who were buried there. Edith Thompson’s details appear on the face of the thombstone, together with her epitaph “Sleep on beloved….her death was a legal formality”. 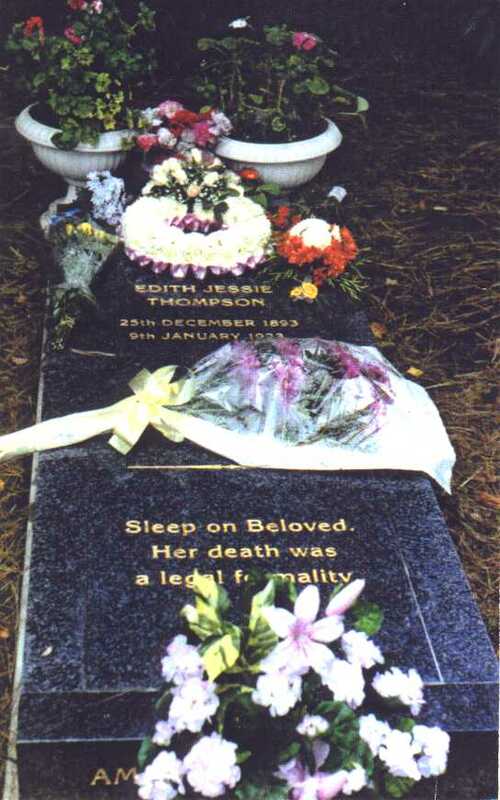 Edith Thompson was one of only seventeen woman hanged in the United Kingdom during the 20th century. I found this information so very interesting and would never have known any of this, if not for this wonderful website. http://www.ancestry.com. This entry was posted on May 18, 2010 at 4:25 pm and is filed under Uncategorized with tags ancestry, Brookwood Cemetery, Edith Thompson, Freddy Bywaters, Graydon, history, United Kingdon, woman hanged. You can follow any responses to this entry through the RSS 2.0 feed. You can leave a response, or trackback from your own site.